With this baby laundry detergent make sure your little one’s clothes are clean and fresh! *Contains natural propolis and green tea for clean and fragrant baby clothes. We at JOHNSON'S® know that you need to protect your baby from everything harsh. Hence you go that extra mile to ensure that only the most gentle reaches her. Which is why, when it comes to her clothes, you soak them separately, disinfect & rinse thoroughly! But, did you know that disinfectants and regular-use detergents could be adding more harshness than what is being rinsed away? Thus, a detergent for baby clothes that promises the most gentle care is the ideal solution for any loving mother. Such a detergent for babies is formulated with a two-fold purpose - to clean your baby’s clothes of any impurities, at the same time protecting her delicate skin from any external roughness! 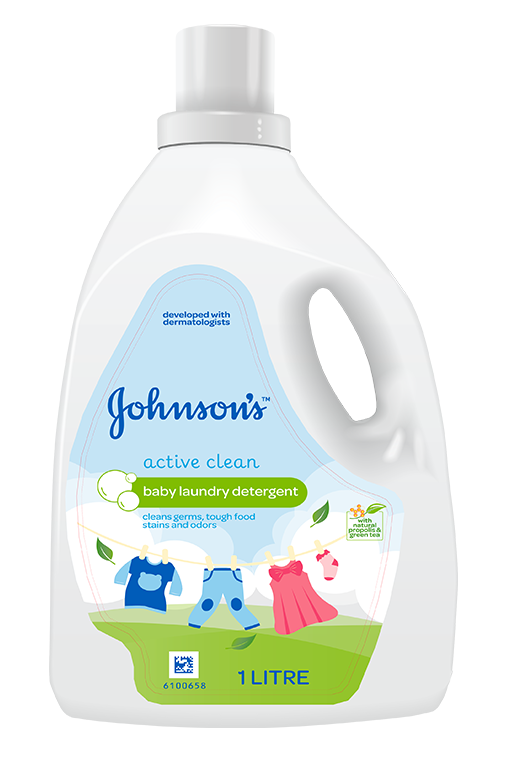 *Add approximately half a bottle cap (30 ml) of JOHNSON'S® Active Clean Baby Laundry Detergent into washing machine. 'The baby laundry detergent contains natural propolis and green tea for clean and fragrant baby clothes.